Semiconductor « Global Market Insights, Inc. Automated Test Equipment market share is anticipated to exceed USD 4.46 billion by 2022 due to its rising demand across various sectors such as defense, telecommunications & IT, automotive, and consumer electronics. ATE is used to automatically diagnose and detects faults in the EUT (Equipment under observation) thereby, ensuring faultless product delivery into the business space. 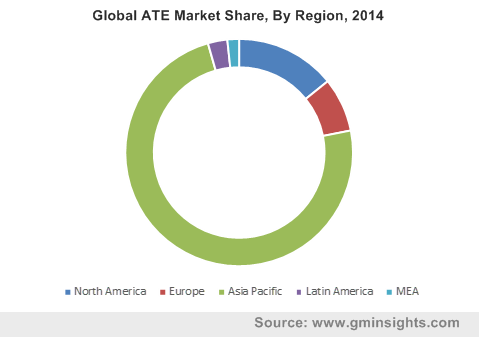 The ATE market is expected to witness a sustainable growth, rising at a CAGR of 2.6% over the period of 2015-2022. Commercialization of IoT or Internet of things will create a pool of opportunities for the ATE industry players globally. The design complexities pertaining to these digitized devices will demand for precise testing of these products, thereby boosting the ATE market growth. Growing smartphone penetration is a major factor catalyzing the market share as the introduction of advanced technological features in these gadgets has in turn increased the design complexities. Also, rising consumer electronics demand, use of electronic equipment in vehicles, growing trend of miniature devices in sectors like defense and IT & telecommunication are also fueling the market share. However, fluctuations in the semiconductor industry are creating a gap between the demand and supply ratio, adversely impacting the ATE market size. Moreover, certain other factors like the cost of the testing instruments as well as frequent modifications in the ATE industry will also hamper the growth in the coming years. ATE application revenue in the IT & Telecommunication industry is forecast to reach USD 2.20 billion by 2022 driven by huge demand for testing services by communication service providers and telecom equipment manufacturers. Also, rising demand for consumer electronics such as smartphones, tablets, etc. will drive the consumer electronics ATE market size to reach USD 1.3 billion by 2022. ATE product market can be segmented as Non-memory, Memory, and Discrete. Non-memory ATE market dominated the overall industry accounting for 75% revenue. Rising consumer electronics demand, coupled with growth in the automotive sector will positively impact the industry share, which is expected to grow at a CAGR of 2.8% over the period of 2015-2022. Discrete ATE market will be the fastest growing product segment registering a CAGR of 3% over the forecast timeframe. 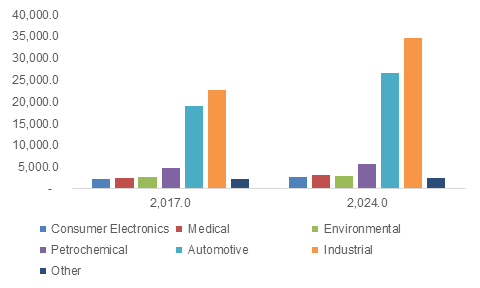 The Asia Pacific ATE market primarily led by India & China is expected to witness a significant surge in the coming years mainly owing to the large number of semiconductor companies present in these regions. APAC market is expected to record a CAGR of 2.8 % from 2015-2022. The US market share will grow at a rate of 2.5% during 2015-2022 primarily due to investment in defense sectors coupled with growth in the telecommunication industry. Teradyne, Advantest, LTX., Advint, Agilent Technologies, Aeroflex, Anritsu, Cal-Bay Systems, and National Instruments Corporation are some of the key market players. Expansion of testing platforms and development of new instrumentation will be the major growth strategies adopted by the industry participants over the next few years. This entry was posted in Electronics and Media and tagged ATE Market, ATE Product Market, Automated Test Equipment Market, Automated Test Equipment Market Report, Automated Test Equipment Market Share, Automated Test Equipment Market Size, Defense Automated Test Equipment Market, Discrete, Global Automated Test Equipment Market, Memory ATE, Non-Memory ATE, Semiconductor, Semiconductor ATE Market, Semiconductor Automated Test Equipment, Test Automation. It is projected that the market size of data center UPS market will go beyond USD 6.5 billion till 2022 and will rise with a CAGR of 7.4% between the years 2015 to 2022 as predicted by Global Market Insights. Growth of new data centers with the reformation of earlier ones is expected to give a considerable boost to the market. Increase in outages and voltage instability will accelerate the demand of capable UPS systems in most of the data centers. Cloud is the hottest technology which renders maximum power in minimum space. Data Center UPS market trend is expected to get an upsurge with this technology. Big data center industries were anticipated to go beyond USD 500 million in the year 2014 and are estimated to touch USD 1 billion till 2022 with a CAGR of 8.5%. Medium centers will rise distinctly because of high demand in diverse fields like universities, cable handling junctions, medical field, government and commercial firms. Small data center market contributed 57% of the overall share in the year 2014 and is likely to rise with a compound annual growth rate of 7%. With great demand in factory floors, medical imaging, industrial sectors, server rooms, the market is expected to boom between the years 2015 to 2022. North America which is a leading user of UPS was appreciated with USD 1.3 billion and is likely to cross USD 2.1 billion till 2022 with a CAGR of 6.9%. Asia Pacific market is estimated to go beyond USD 1.7 billion till 2022 and is likely to rise with a CAGR more than 8.6% between the years 2015 to 2022. Europe market noticed more than USD 990 million in the year 2014 and is anticipated to cross USD 1.68 billion in the coming years. Speeding up the demand from financial sectors, healthcare industries, insurance services and computing infrastructure is projected to fuel up UPS market share. Saturation in semiconductor industry is projected to obstruct the demand in the coming six years. Many global U.S. manufacturers are estimated to raise their voice for the slowdown of industries. Countries like China and Taiwan, which are considered as electronics center, will be impacted more thus, disturbing the overall demand in industries. Major industries which have captured prominent shares of Data Center UPS market include Emerson Network Power, Controlled Power Company, Belkin International, Gamatronic Electronic Industries, Schneider Electric, Toshiba and others. This entry was posted in Electronics and Media and tagged Data Center, Data Center Design, Data Center UPS Market, Data Center UPS Market Report, Data Center UPS Market Share, Data Center UPS Market Size, Data Center UPS Sizing, Global Data Center UPS Market, Large Data Center UPS, Medium Data Center UPS, Networking, Semiconductor, Small Data Center UPS, UPS tracking, World Data Center UPS Market.